Australian 10 Dollar paper Note Fraser/Cole General Prefix and One of the last paper $10 notes issued and valued at a few dollars over its face value. The Australian paper ten dollar note was first issued in 1966 replacing the 5 pound pre-decimal banknote. The paper note was continued until 1993 when it was replaced with a polymer issue plastic banknote with the same blue/black and yellow colours. Polymer banknotes replaced Australian paper notes after successful trials with the 1988 Bicentennial commemorative banknote. 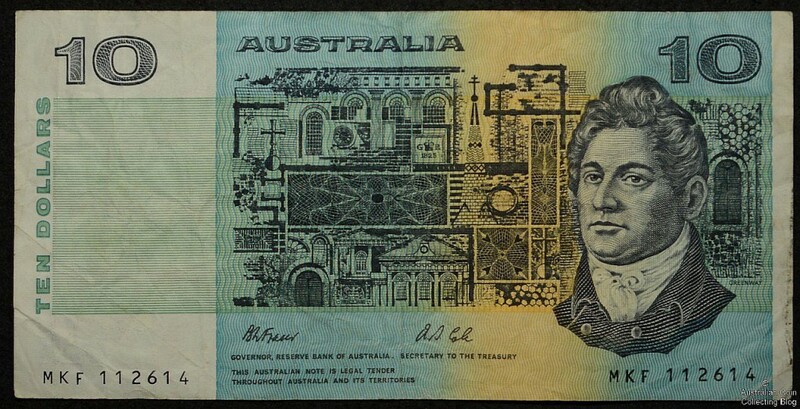 The old paper Australian ten dollar note features a portrait of Francis Howard Greenway on the front along with a collage of his architectural works. The front also depicts the two serial numbers and denomination of 10. The words “Commonwealth of Australia”appear on the earlier notes 1966 to 1974 then it was shortened to “Australia” from 1974 to 1993. The back shows a profile portrait of author and poet Henry Lawson on a background collage of photographs from his time, manuscripts of his works and personal letters. The notes measure 155 milimeters by 77.5 millimeters, this is important to know as many collectable banknotes are trimmed or tampered with to increase their grade and therefore value. 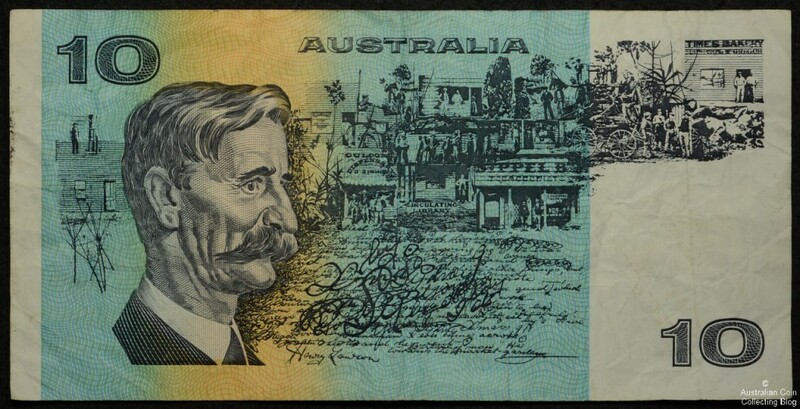 The Australian paper ten dollar note was first issued in 1966 with the Coombs/Wilson signature combination. Soon after decimal changeover it was reported that counterfeit $10 notes were circulating and police already had $140,000 worth of forged notes by early 1967. The counterfeit notes began flooding Victoria in late December 1966. The Reserve Bank of Australia set to inform the public of how to detect these fake notes and published advertisements in leading daily newspapers on what to look out for so you don’t receive fake notes. The signature combinations appearing on the paper ten dollar banknotes are the marks of the Governor of the Reserve Bank of Australia and the Secretary to the Treasurer which change over the years. There are 10 combinations of these signatories on the paper ten dollar note. After determining the signatures on your paper banknote another factor vital in determining it’s value is the serial number. Most importantly look out for a star replacing a missing numeral. Star replacement notes are very valuable in any condition, these replaced soiled or damaged notes in a bundle so bank staff could keep track of the number of notes in a bundle. This practice was discontinued in 1972 so these star or asterisks are only found on the earlier notes. Serial numbers begin with 3 letters and end with 6 numbers, the two serials on the note should match. The three letters are the prefix and identify whether it be a fist issue, last issue or general issue for those signatories with the first and last commanding a premium over the general issues. Numbers which are repetitive, solid number or radar numbers are also commonly kept by collectors for a bit of fun and may sell for a higher price. Consecutive serials on multiple notes may also fetch a higher price when sold. Error banknotes can command a significant premium over the notes face value but this will depend on the type of error. Types of banknote errors include mismatched serial numbers, inking errors, paper folding and cutting errors as well as the starnotes mentioned above.